I looked at the recipes we’ve posted this fall and noticed a distinct lack of pumpkin dishes. Maybe that’s because I love sweet potato everything (including a sweet potato cake coming next week), but I thought it was time to have some pumpkin in my life. People go crazy over pumpkin. I made these pumpkin cupcakes last year and they were quickly devoured by my sister, roommates, and an accidental serving to my roommate’s dog. Are dogs supposed to have pumpkin cupcakes? I guess he wasn’t about to miss out on a pumpkin cupcake, and you shouldn’t either. 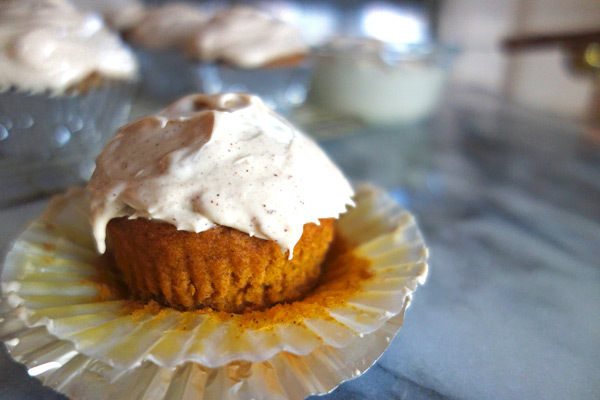 The cream cheese frosting tastes like a cinnamon roll and is a perfect complement to the pumpkin cupcakes. Preheat the oven to 350 degrees. Mix the flour, baking powder, baking soda, salt, cinnamon, nutmeg, and cloves in a medium bowl. Mix the pumpkin, brown sugar, eggs, and milk in a large bowl with handheld mixer on low-medium speed for 2 minutes. Slowly pour the flour mixture into pumpkin mixture until completely incorporated. Pour the cupcake batter into a lined cupcake tin. I fill them about 3/4 full, let’s not be stingy. Bake the cupcakes for 15 minutes. Make the frosting while cupcakes bake. Mix the cream cheese, butter, and vanilla in a medium bowl with an electric mixer on medium speed for a couple of minutes. Add the cinnamon and mix until evenly incorporated. Then, slowly add the powdered sugar 1/2 cup at a time, mixing after each addition. I don’t like my frosting too sweet, so if you prefer a sweeter frosting add about 1/4 cup of powdered sugar until it is sweet enough for you. Let cupcakes cool completely before frosting so your frosting does not melt all over the place. My least favorite part about cooking and baking is cleaning, so if I can limit the mess I’m making for myself, I do my best. Of course, if melted frosting is a look you’re going for, then go for it! Otherwise, be patient and you will be rewarded with non-melted frosting. Mix flour, baking powder, baking soda, salt, cinnamon, nutmeg, and cloves in a medium bowl. Mix pumpkin, brown sugar, eggs, and milk in a large bowl. Slowly pour flour mixture into pumpkin mixture until completely incorporated. Line cupcake tin or spray with nonstick cooking spray. Fill 3/4 full. Bake cupcakes for 15 minutes. Make frosting while cupcakes bake. Cream cream cheese, butter, and vanilla in medium bowl with electric mixer on medium speed. Add cinnamon and mix until evenly incorporated. Add powdered sugar 1/2 cup at a time, mixing after each addition.